Does anyone have a sample code of how to move Shortcuts on the Desktop? 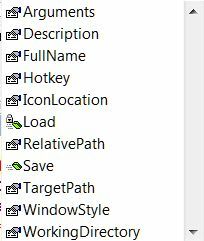 ....but inspecting the feature list of the object loMyShortcut I do not see a way to move the icon on the DESKTOP screen's X, Y space. Any suggestion would be very appreciated! If the user has Windows set to its default (auto-arrange) you shouldn't mess with it. Desktop arrangement belongs to the user. The most basic arrangement you could organise is using the ASCII sort to move the shortcut to the first/last positions on the desktop - prefix the name of the shortcut with a dollar sign will make it near the beginning (top left most likely) or an underscore to make it the last item (bottom right most likely). Bear in mind what Dan says above, and also that some 'special' icons are likely to take precedence anyway. If a company sold me a program which re-organized my desktop, I would sue that company for all it was worth! My desktop is MY desktop!!! Bit extreme Tore, but your point is well made. A little like some installs changing your internet settings/home page and add-ons. The thing is that some folks have figured out how to move the icons on the desktop and offer software like IconShepherd, but they make sure that it wrecks the icons from time to time in order to force the user to buy another copy. That makes me mad... I want to gain control over the icons. As regards the advice not to mess with the positions, sorry guys, I have everything organized in my head and when an icon moves away it is like somebody moving my office into another foreign city just to make my life difficult. I am a clever chap. I am not Harry Potter. Do like I do: I have zero icons on my desktop, none. No need for icons with Win10 + SlickRun. But it is nice to have a fan! Right? I will look into SlickRun... looked at it and it seems interesting. What is it that you like among its features which helps you the most? Regarding SlickRun, I use it to start most of my programs. Pretty much like people use desktop shortcut, but without cluttering the screen. Whenever I want to run a program, I press Win+N and type parts of the name I have given the "shortcut", called Magic Word in SlickRun. I use the same solution to open my favorite folders and favorite URLs.